When Buzz Lightyear is on the bed after Andy put him there, a pan shot is seen through his eyes. Then we can hear breathing that is similar to Darth Vader's. When Sid "interrogates" Woody, he says: "Oh! A survivor! Where's the Rebel base!? Talk!!!" and a short bit after this: "Where are your Rebel friends now? Hahahaha!" When Buzz sees the Buzz Lightyear commercial on the TV, the sound we can hear when Buzz "shoots" a laser is a TIE fighter's cannon sound. In the opening scene with the space background shot, the music is very similar to the what we can hear after the Star Wars titles. There is also the moment just after this when Buzz passes by, like after every Star Wars title, a ship passes by. When a camera comes out through a trap door in a wall, it is a nod to Jabba the Hutt's palace's camera at the main entrance. Zurg says, "Come to me, my prey," like when Darth Vader says to Luke, "Come to me, my son" in The Empire Strikes Back. At the same moment Buzz goes into a hall that lights up when he enters, just like the one Luke takes during his duel against Darth Vader on Cloud City. The room he arrives in has a great pit that looks just like the one in the Emperor's throne room on the second Death Star. When Zurg arrives, he says: "So, we meet again, Buzz Lightyear, for the last time." like Darth Vader in the Death Star when he says to Obi-Wan "I've been waiting for you, Obi-Wan. We meet again, at last." 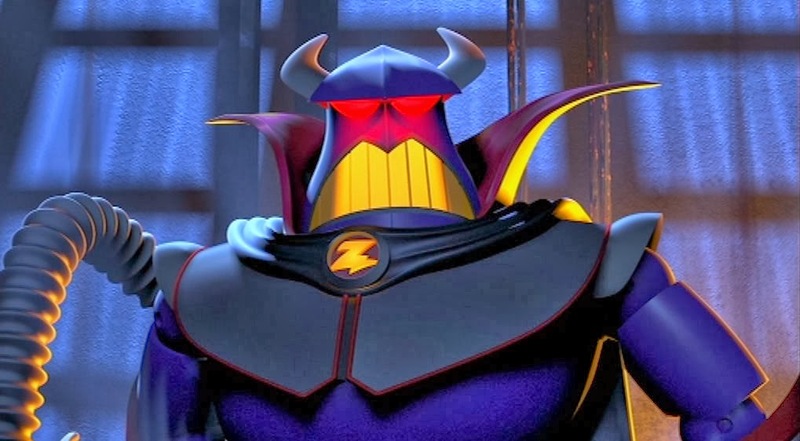 And of course Emperor Zurg's design is directly inspired after Darth Vader's armor, especially the helmet. The opening scene contains a number of sound effects from Star Wars, including Darth Vader's breathing, and X-Wing, TIE fighter and lightsaber sounds. Later in the movie, Buzz Lightyear II accuses Emperor Zurg of killing his father. Then, Zurg reveals that he is Buzz's father: "No, Buzz, I am your father," as Buzz screams "Noooooo!" while descending down the elevator. By the end of the film, they're playing together and experiencing lots of good father-son bonding. At the end, when Trixie and Rex are playing on the computer, we can hear a typical Star Wars sound when they finish their game. This sound is the one heard when C-3PO and R2-D2 flee from the Tantive IV in an escape pod, or when Mars Guo's podracer's motor explodes after having sucked up the tool the dastardly Sebulba had thrown to it. When Big Baby throws Lotso the Bear into the dumpster, it is a reference to Darth Vader throwing Emperor Palpatine into the reactor. When Buzz is knocked out of the window in Toyota Story, they use the famous Wilhelm screem.